This is a Helmut Lang top that I knocked off. The above photos are the original garment, first photo is from Shopbop.com (I'd link to it, but it's already sold out!) and the second is me trying the top on at a local store that shall remain unnnamed because they would most certainly frown on people taking clothes into the dressing room to take photos and measurements! (I realized later that I tried the top on backwards - oops!). Gotta love digging into the Burda archives! I wanted a skirt that I could wear during the day with flats, and dress up an night with heels. The edgy front zipper meant this style fit the bill. The pattern is BurdaStyle 8516 - Elinor (I made this one up for the first time earlier this summer). Only change from my last top is that I didn't pleat the sleeve hems, and this one has a shorter sleeve and bodice hem. This is another Vera Wang Lavender Label piece from Fabric.com, a silk twill that they named "scratches" on the website, so that's what I think whenever I see the top. (BTW - I had no idea that I'd get so much immediate use out of these VW fabrics, quite unusual for my fabric to go from stash to garment in 2 months or less!). I've already worn this one a few times and I'm really happy with it. It's finished with French seams and narrow hems. The neckline is finished with self bias binding. Phew! Now it's time for me to get a few hours of rest - we are heading to Italy (yes, I'm thinking what you're thinking - La Mia Boutique and *fabric*!!) but I won't feel truly relaxed until I'm on the plane and it's in the air. Ciao! Waou, so many new things! I love the Asymmetric top! Two great pieces! I love the short skirt/big top look. I love the new pieces, especially the asymmetrical and 'scratches' top. You'll look just the part in Italy. Have a wonderful time away and I look forward to pics. I love the top and I just love your style!!! Where did you get those black heels? I love the asymmetric drapey top. What pattern did you use to make it? Also, I wanted to let you know that I purchased the cardi-wrap pattern, thanks to you, and hope to make it in the next month or two. Love both pieces! They look great! Great garments --- really love the fabrics you chose. Hope you have a fantastic time in Italy --- I am so envious! Wow, all those pieces look awesome. Have a great vacation! Can't wait to hear all about it. Italy is one country I've always wanted to visit. Great garments!! I love your personal style! Those shoes are fabulous too! You managed to make stylish and very versatile pieces. Have a great time! You've been a busy girl! Love your top knock-off... it looks great! And your skirt is very cute- love the decorative zipper. Great use of the Fabric.com stash. You look soooo nice in your new travel wardrobe. Have a good trip! You did an awesome job on that knockoff, wow! That's it exactly. And it looks great on you, as does the skirt! But please tell me more about those fabulous shoes. :-) When you get back from Italy of course, *sigh*. Have a wonderful trip!! Great vacation pieces! 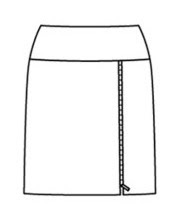 I especially love the skirt with side zipper. But... I love the asymmetric drapey top specially. have a great vacation...I have never been to Italy...so jealous. great sewing, I especially love the zip skirt. I haven't seen one like it before and now you've got me thinking. Lovely pieces! I especially like the Lang top. It's very chic! I absolutely adore the clothes you make. The assymetrical top and the day/night skirt are my favourites, but they are all great. Great pieces, goes to show it's worth hanging on to those old Burdas! Have a lovely vacation! Love it all! You have great style. Love all three! Have a wonderful trip. Both tops are gorgeous, especially the first one. A fabulous knock-off! What a lovely new set of clothes! They go nicely together too. LOVE your new clothes!!! Great job! Get out!! that "scratch" was the one fabric i was going to buy and Loohoo talked me out of it!! you are looking fab as always. Do i need to bring attire for "going out"?? lol. So glad I'm not the only person who does "research" in dressing rooms! Enjoy Italy, tell us all about it. I'm going to Florence in later October, so I'd really appreciate any recommendations if you're heading that way. Have a wonderful Italian trip! Your latest sewing creations are just lovely. I can't wait to see what wonderful things you do next! Wonderful clothes! Your Helmut Lang is a great knockoff. Enjoy your vacation. Sigh...I'm in love with that asym. top! Would you ever consider sharing the patterns that you have drafted (for those of us who like to sew, but lack the pattern-making capability).